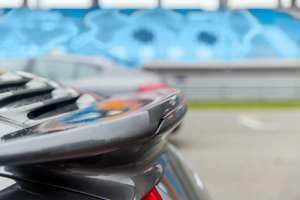 What types of plastic materials work best for spoilers and ground effects?? When it comes to keeping your automobile fresh and stand out from all of the other vehicles on the road today there are many things you can do. One of the simplest forms of doing this is changing the appearance through aftermarket plastic addons. Most of this refers to the style of the body, body kits, types of spoilers, air dams , different bumpers, etc. Although, a lot of upgrades can be based on appearance only, other products may focus more specifically on functional ground effects, which directly change the performance of the vehicle boosting things like the aerodynamics, fuel economy, and/or weight, which all relate and have an effect on each other. You will mostly see this on higher end faster performance cars where it can make a difference. But most of the time they are for looks only. The first thing to focus on, without respect to any individual supplier or company, is the type of material used for these aftermarket plastic parts. When dealing with added parts made mostly of plastic, there are a few main materials used. Fiberglass, ABS Plastic, Carbon Fiber, Polyurethane, and Composite make up the majority of the market, and each has its benefits and drawbacks. which is ideally towards the lower end of the market. Fiberglass has many benefits including it being lightweight, temperature resistant, ease of paint adhering to its surface, as well as customization and larger availability of fiberglass parts due to its lower cost of manufacturing. It’s main drawback is its brittleness, which affects its ability during installation to remain intact without breaking/chipping/cracking. I have found that if the part is not made with a high standard, the fit is often a poor fit. And guess what, you are stuck with it because there is no reforming it unless you break out the grinder and more fiberglass repairing. I had to cut a front air dam in half once just to get the curves to match the car. Hours of more fiberglass work just to make it right. Also, if installation goes okay, there is still the risk of an accident occurring on the road increasing the odds of breakage, and more careful driving is suggested in areas with a lot of barriers, or change of elevation such as steep driveways and/or parking lots. which are seen as a middle ground option for most of the secondary parts. Typically, ABS is used in stock options for cars, so will be what your new car comes equipped with after buying it. ABS has properties that are stronger and less rigid than fiberglass, but is also heavier and more expensive. This makes ABS less risky during installation and on the road for damage, but has a loss of fuel efficiency with an increased upfront cost as well. However, ABS is also heat and chemical resistant, as well as less susceptible to dents, which could increase the durability of a product with this type of material. which is possibly the self-acclaimed and unanimous king of aftermarket plastic parts. Carbon fiber parts just look cool and will most definitely set you apart on the road. They have incredible strength, durability, and are very lightweight. However, even though they are strong they are susceptible to cracking and chipping just like fiberglass. It just takes a stronger impact to do it. Carbon fiber parts are generally not painted over when talking about aftermarket accessories but can be if they need any repair which you will loose the look. One thing I have noticed about them is over time the top coat tends to fade and delaminate. So a big tip to those who buy them. Have a shop spray a clear coat on them before you put them into use. which is somewhat of a mixture between Fiberglass and ABS plastics. Polyurethane is the most flexible of them all making them easy to install. However, they are a little heavier than Fiberglass and lighter than ABS plastics, and the cost also falls in between Fiberglass and ABS. It’s heavier weight allows for more durability than Fiberglass, but Polyurethane’s smooth and refined surface sometimes makes it more difficult to paint, often times requiring extra processes to get a new paint job to stick. which is a combination of any and/or all of the above, as well as other plastics that were not listed. A composite is just a make up of different types of materials. So, as you can imagine, the customization could be endless in what type of specific product you wanted in terms of properties, appearance, and cost. However, composites aren’t as mass-produced as the other plastics mentioned in this article, which adds an added cost and more variability of what the outcome might be. Duraflex is probably the most common composite on the market if you would like to look into learning more. That sums up the extent of types of materials used in aftermarket plastic parts, which is a good base into looking more into what type of product you would like whether it be a full body-kit or small accessory. Most things that are on the aftermarket will have some kind of benefit compared to what your vehicle comes with, however if you consider cost/budget and the things that you desire most, you should be able to make a valuable and desirable decision and stand out more on the road!